It was during the 2010 summer outing of the UP Astronomical Society to Cagayan de Oro and Camiguin that I was able to experience whitewater rafting. From the airport we checked in to our hostel and then went to the site, in the sleepy village of Makahambus. After outfitting us with helmets and life jackets and a brief intro on paddling and safety guidelines, the guides then started us on a 12 kilometer Class II and III course. 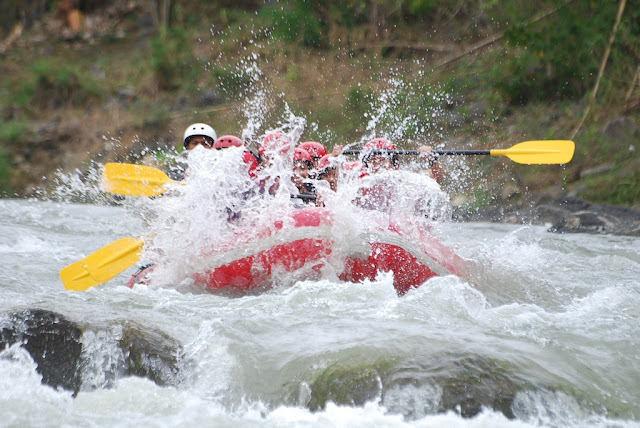 There are 16 rapids along the way, and a few of them involve getting spilled from the raft. The whole course will take about 3-4 hours. You may request the guides if you want more challenging rapids, and if you want spills or if you want to float down the river in some parts of the course. Usually there are about 3-4 groups of rafters that set out at a time. How to get there: Cagayan de Oro, one of the largest cities in the south of the Philippines, is about 1hr 20mins by plane from Manila, and is served by the major airlines. The guides can fetch you from a pre-agreed meeting place for transit to the Makahambus area, the staging point of the course. Where to stay: Magis Training Center of Xavier University (call Aling Ineng, +63.907.970.3120) accepts transients for about PhP 200/person/night. It is along the highway and is near the SM mall.